FFF is short for Fused Filament Fabrication 3D printing. The filament to a 3D printer is like the ink to a writing pen. The filament is typically made of a type of thermoplastic that can be melted and formed into different sizes and shapes. There are various kinds of filaments that you can work with, and each has its own characteristics that make it suitable for a specific application. When you're trying the filaments out, you should get a solid background on the characteristics of each material, the print bed requirements, and extruder temperature recommendations. The main characteristics include the material being chemically resistant, composite, dissolvable, elastic, fatigue-resistant, flexible, heat-resistant, impact-resistant, rigid, soft, UV-resistant, water-resistant, and whether or not it requires a heated bed. They're also usually characterized by a prominent feature such as being standard, flexible (has the ability to bend), composite (infused with another material), specialty, and support (act as support structures) filaments. Polylactic Acid (PLA) is one of the most common materials used for desktop 3D printing. This is because all FFF/FDM 3D printers are able to print with PLA in their stock setup. It's pretty easy to use and is eco-friendly. It also doesn't require a heated print bed which makes it ideal as a starter material for beginners. PLA is quite durable but not as strong as ABS, so it's better suited for printing objects that won't be subjected to high impact. Its extruder temperature should be around 180°C to 230°C while its (optional) print bed temperature should be 45°C to 60°C. Acrylonitrile Butadiene Styrene (ABS) is the second-most common material used in 3D printing. It's a lot more rigid and durable as it can handle high temperatures. This makes it suitable for handling high temperatures required for making phone cases and other forms of enclosures such as LEGO bricks. However, it's a little harder to print than PLA as it requires a heated print bed to prevent the deposited filament from warping. It also produces a lot of fumes and bad odors, so it requires a well-ventilated room. Its extruder temperature should range between 210°C to 250°C while its print bed temperature should be between 95°C to 110°C. Polyethylene Terephthalate Glycol (PETG) is a material that's typically associated with water bottles. It can be considered a mix of ABS and PLA, so it's tough and durable like the former but also easy to print with and doesn't have an odor like the latter. It's the ideal material for someone looking for the best of both worlds. The extruder temperature should range from 220°C to 235°C while the print bed temperature should be between 75°C and 90°C, although the heated print bed is not mandatory. Nylon is both flexible and rigid so it's suitable for making functional parts like gears, hinges, and bolts. Being a high-temperature material means that many 3D printers can't print with it out of the box and may need a hotend upgrade. You should keep in mind that Nylong is hygroscopic, which means it will absorb moisture so you need to let it dry completely before you print with it. Otherwise, the print quality may be poor no matter how well you configure your 3D printer's setting. To keep the filament in tip-top shape, you should store Nylon in a well-sealed and moisture-free space and remove the spool from the 3D printer once the print is finished. Its extruder temperature should be between 220°C and 260°C while its print bed temperature should be between 70°C and 90°C. High Impact Polystyrene (HIPS) is a dissolvable kind of filament which is used mainly as a support material when one is printing complicated objects –especially on a dual extruder 3D printer. Once you expose it to limonene, it dissolves. However, you can't pair it with any material as it's best used with ABS as both materials have similar temperature requirements. Despite the fact that HIPS is commonly used as a support material, you can still use it as a standalone material thanks to its lightweight and durability. Its extruder temperature should range between 210°C and 250°C while its print bed temperature should be between 100°C and 115°C. Polyvinyl Alcohol (PVA) –like HIPS- is mostly used for supports. Unlike HIPS, however, it's a more versatile support material as it can be paired with PLA in a dual extruder setup. Once it's exposed to water, it dissolves. It can also be used as a standalone material. However, it's sensitive to moisture so you might need to be a little more careful when you're printing with it. It's best-suited for printing quick prototypes that you don't intend to keep for a long time. Its extruder temperature should range between 180°C and 230°C while its print bed (optional) temperature should be between 45°C and 60°C. Acrylic Styrene Acrylonitrile (ASA) is a kind of material whose characteristics are similar to ABS as it's durable and impact-resistant. It's actually an improved version of ABS where it has better weather-resistance and UV-resistance. This makes it the perfect material for outdoor use objects. However, as it's similar to ABS in its advantages it's also similar in the disadvantages as it's harder to print with than PLA as it requires a very high temperature. It also produces potentially harmful fumes, so it requires good ventilation. Its extruder temperature should range between 240°C and 260°C while its print bed (optional) temperature should be between 90°C and 110°C. Thermoplastic Polyurethane (TPU) is a kind of flexible filament with rubber-like characteristics. It is easily bent and stretched and can be used for a number of functional objects. Because it's a flexible material (like Nylon), most desktop 3D printers can't print it out of the box. Usually, a 3D printer with a direct drive filament feeder system is recommended to work with TPU, but you can do with a Bowden system. You just need to make sure the filament path is well-constrained to execute the job well. The extruder temperature should range from 225°C to 235°C while the print bed temperature should be between 45°C and 60°C, although the heated print bed is not mandatory. Polypropylene (PP) is a more flexible and tougher material than PLA that gives you heat and impact resistance. Great, but what's the catch? It's a tad bit difficult to use with a lot of warping and adhesion problems. It's a pretty advanced high-temperature material with enclosure requirements and a very specific print surface setup. So unless you have a lot of experience with 3D printing, you should stay clear of PP. Its extruder temperature should be between 210°C and 230°C while its print bed temperature should be between 85°C and 100°C. Polycarbonate (PC) is a very tough and durable material with amazing impact and heat resistance. It's also flexible to some degree as it can bend without cracking. It's not as flexible as TPU or Nylon, however. It's hygroscopic, so you need to isolate it well when you store it and make sure it's completely dry before every print. It also requires a high temperature for both the print bed and the hotend –basically putting budget-friendly 3D printers out of the picture. An enclosure and all-metal hotend are required for PC. Its extruder temperature should be between 270°C and 310°C while its print bed temperature should be between 80°C and 120°C. This kind of filament is infused with carbon fiber with ABS, PLA, Nylon, and PETG being the most common base materials. It's strong, wear-resistant, and strong. This makes it suitable for printing frames, RC car parts, and functional prototypes. A drawback to this kind of filament is its high abrasion that has an impact on the nozzle. That's why a hardened steel nozzle is recommended for working with it as the common brass ones won't endure. Carbon fiber reinforced filaments can also clog your nozzle. In order to prevent that from happening, you should get a nozzle with a diameter of at least 0.5 millimeters. If you're a beginner or have a 3D printer that's cheaper than $500, you shouldn't use this kind of filament. These filaments are infused with metal powder with PLA being the most common base material. It looks and feels like real metal, however, brass, bronze, and copper are usually the materials used for this composite filament. If you print an object with metal-infused filaments, it'll certainly be heavier than an object that's printed with regular PLA, which is why it's easy to tell the difference between a metal-filled filament and a metal-colored material. You should always watch the nozzle when you're printing with a metal-filled filament as the infused metal makes the material abrasive. These filaments consist of PLA and wood fiber so they have the texture and looks of real wood. The actual amount of wood fiber in the material depends on the brand. It's quite easy to print with wood-filled filaments as PLA is the base material and it doesn't require a heated print bed. Since 3D printing is an ever-expanding technology, there are no limits on the kinds of material and variations that can be used when printing. Other filaments available are POM, PMMA, wax, clay or ceramic reinforced, color-changing, conductive, glow-in-the-dark, magnetic, and sandstone filaments. 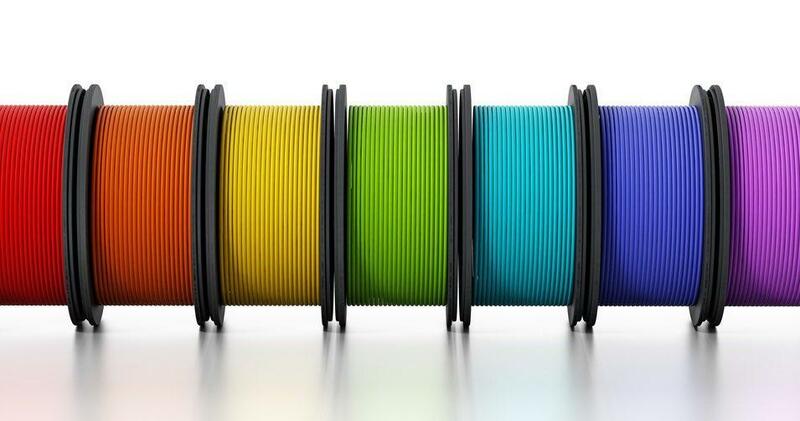 We've listed some of the most prominent types of filaments, but the possibilities and options are quite indeed endless.